Lineage. Constituted 333rd Fighter Squadron on 18 Aug 1942. Activated on 23 Aug 1942. Inactivated on 12 Jan 1946. Redesignated 131st Fighter Squadron, and allotted to Massachusetts ANG, on 24 May 1946. Extended federal recognition on 24 Feb 1947. Redesignated: 131st Fighter-Interceptor Squadron in Nov 1951. 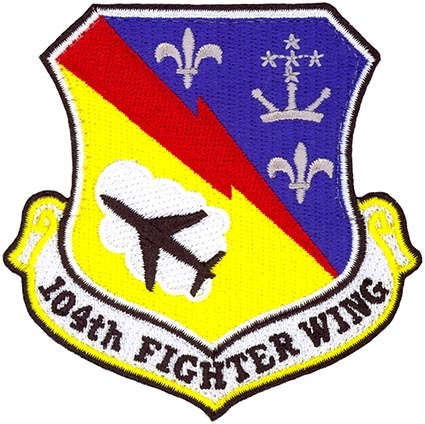 Extended federal recognition as 104th Fighter Group (Air Defense) on 1 May 1956. Redesignated 104th Tactical Fighter Group on 10 Nov 1958; 104th Fighter Group on 15 Mar 1992; 104th Fighter Wing on 1 Oct 1995-. Components. Groups. 104th Operations, 1 Oct 1995-. Squadrons. 131st Fighter-Interceptor (later Tactical Fighter, Fighter), 1 May 1956-. Assignments. 18th Fighter Group, 23 Aug 1942; 318th Fighter Group, 11 Jan 1943-12 Jan 1946; 103rd Air Defense Wing, 1 May 1956; 102nd Air Defense Wing (later 102nd Tactical Fighter), 1 Jul 1957; 108th Tactical Fighter Wing, 1 Jun 1972; 174th Tactical Fighter Wing, 1979; 102nd Fighter Wing, 1 Jun 1992; Massachusetts ANG, 1 Oct 1995 -.